Did you know that your selfies reveal your bra size? And did you know there's a business in it? This technology got me pretty excited. ThirdLove is an unfortunately named app that allows women to easily find bras that fit them based on the selfies they have stored on their smarphones, in combination with technology which uses computer vision and image recognition algorithm to size the women up. The outcome is not only recommendations of best bras for you, but bras made to be best for you. It's like having an ultimately personalized shopping experience literally at the palm of your hand. Once this technology expands to other categories, like shoes and jeans and dresses, it's going to take e-commerce to a completely new level. Actually, it already have taken it. This is a pretty amazing resource. It’s basically a compilation of all possible wearable devices, organized by the area of the body where they are worn and by the function that they perform (wellness, entertainment, lifestyle, etc). The site is incredibly easy to navigate and incredibly useful for your next brainstorm. Credits go to@bud_caddell for discovering this gem. You can see the full list of wearable tech devices at the bottom of the site. This is incredibly interesting - knowing what kind of content your audience is going to be eager to watch before you create it can easily be the single biggest Hollywood dream. And Netflix is living it. The result? For the first time, the video subscription service surpasses HBO in number of domestic subscribers. You can read the article where the quote above is from here. Why is academia present so little in the everyday life? When I earned my Ph.D. in Spring of 2010, the first thing I did was to finally get myself a full-time job in a digital marketing agency. I have worked freelance, and a lot, in this industry long before I got my Ph.D., and the focus and the goal of earning a doctorate for me has always been getting a job outside of academia. My vision was to bring the academic rigor and discipline in the domain of real world's problems. (I have soon discovered that the abovementioned rigor and discipline are only useful when combined with social savvy, which is something that academia doesn't teach you). Digital marketing field, when I started working in it in 2006, attracted the brightest people and had the most interesting and challenging problems. And I want to be part of it. I have studied things like flat organizations, organizational responses to uncertainty, complex networks, the interplay of technology and organizational forms, complex adaptive systems, socio-technical networks, economic sociology and behavioral economic a good 10 years before professionals in my field started paying attention to these issues. At the same time, I am keenly aware that the entire wonderful body of work within the walls of academia has not been - and is still not - available to those same professionals who can benefit from it the most. Thus I consider myself one of the lucky ones. While at school, I enjoyed the wonderful world of learning from the best, the freedom of etnographic research, the delight of confirming or denying a hypothesis. When one of my fantastic dissertation advisers asked my why did I do a doctorate if I don't want academic career, I replied "for the knowledge." For the knowledge that I can take to the outside world. The smartest and most forward people I ever met are in academia. I miss them incredibly sometimes, as well as our conversations and them making my brain work better. I wish they were more part of the world that I am in now. This is a great NYT article talking about the dual problem of the academics existing behind the walls of academia and the simultaneous attitude of anti-intellectualism that tends to keep them there. "He made happiness respectable goal for a society"
Behavioral economics is a fascinating field of study - and not only because it zoomed in on human irrationality that occurs outside the domain of emotions. Behavioral economics combines the fields of psychology, economics, sociology and culture into a scientific method that enables us to study lofty topics like happiness, decision-making, planning for the future, default choices, experience vs. memory, and judgment, with rigor previously not thought possible. I am a big fan. I stumbled upon this great article on Daniel Kahneman in the words of his peers - Steven Pinker, Richard Thaler, Nassim Taleb, and others. Give it a read. The name is a bit silly, but everything else about this program is amazing. "Give-and-Tako" started in the city of Geneva, where orderly Swiss citizens now can exchange items best described as "one person's junk is another person's gold." Designated boxes called Neighborhood Exchange Boxes are peppered throuhgout the country to make giving (and taking) so easy and convenient that the hope is one day it becomes a routine habit, like exercising or brushing one's teeth. Say no. Fish for great ideas together. Good read in yesterday's NYT. The speed of online deliveries has become critical competitive differentiator between retail brands. Same-day delivery programs in the UK, Walmart delivery crowdsourcing and Google Express have invented new programs to cover "the last mile" between the customer and their order as quickly as possible because that was something Amazon doesn't do. Demand prediction sounds like something from a sci-fi novel, but it isn't. The amounts of data that Amazon has is massive, and we, human beings, are much less fickle than what we'd like to think (enter here the entire debate on the free will). For example, we buy bestseller books because they are bestsellers or that t-shirt because everyone else is wearing it or rain boots because it's raining - all Amazon needs to do is to pre-fill its shipment labels and patiently wait for us to click that buy button to fill in the rest. The race for the last mile is becoming ever more interesting. Great digital brands are built around great customer experience. (And they have to, as customer experience is their business). Think Warby Partker, Net-a-porter or AirBnB. All of them focus on making customer interactions as frictionless as possible, with as little pain points. Design thinking helps a great deal in this process. Design thinking methodology favors making of hypothesis and then using user research, brainstorms, storyboards, "what ifs" and scenario thinking to test those hypothesis and arrive at the optimal - most viable, feasible and desirable - customer solution. This is a great article on how AirBnB uses storyboard method to visualize their customer experience. Have a look. The most relaxing song ever. I will need this a lot and often. "Weightless" audio track is created by Marconi Union together with the British Academy of Sound Therapy. What makes it unique is that it's the result of a scientific study searching for the "most relaxing song ever." Mindlab scientist concluded that the song reduced anxiety of its test listeners by 65% and lowered their resting pulse rates by 35%. Glimpse is a new dating app that offers, well, a glimpse into the interests, passions and observations of Instagram users. Based on this information – a.k.a. photos that a user has posted – Glimpse finds a romantic match for them. If you love photos of bridges, city scenes, and details, out there just may be someone for you who loves the same things. Glimpse allows you two to connect and start chatting. The idea is pretty good, as we express ourselves the best when we are not trying to intentionally do so. Dating profiles are quite artificial environments where we are boxed into specific information categories by design. Glimpse is a aimed at solving that by turning content into a medium of self expressions (my interest are who I am) and into the social object (something to talk about). Try out Glimpse here. If rear-facing camera on smartphones was a technology that enabled the explosion of the selfie, then 3D printing is technology that is potentially behind the revolution in our relationship with ourselves. We have Shapify.me to thank for this. The service uses motion sensors in a Microsoft Kinect to scan the body of a person interested in having his/her own statue. Once 3D scan is complete, and the customer chooses the version they like most, Shapify sends the scan to a 3D printing company Sculpteo, which is responsible for turning the scan into a statue. In a matter of days, happy newlyweds or someone with immense love of themselfies can have another object to adorn their home (or office desk). Best of all, you can finally print that imaginary boyfriend of yours in real-life size! Once 3D cameras come to our smartphones, this will become a routine. I need to set a room in my apartment for all statues of me me me throughout life. Can't wait to playact for guests all the most important events of my life as they happened. It's going to be totally awesome. If you think that the photo above implies that something dreadful is going to happen, blame your own imagination for it. The pic is depicting a scene from the online shopping site Lamoda's currier/stylist service. This high-touch service personally delivers items ordered online to one's home, let's customers try the items on, offer advice (when asked), packs up the items customers did not like after all, and charges them for those they did. Although I am typically scared of anything coming out from Russia, this is actually a great example of problem-solving. Lamoda's seemingly luxurious, highly personal service was born out of necessity. Russian postal service is notoriously unreliable and international curriers like DHL are too pricey for the average consumer. Enter trained & unformed personal stylists who bring your package to your door. (This solution probably addresses the unemployment in Russia, too). Coincidentally enough, online retailers get ahead with customer-centered innovation, more than with any other kind of improvements. Moda Operandi's real-time commerce propelled this brand into the forefront of digital luxury retailers, Amazon's "let me ship this to you before you even buy it" secures rise and rise of this everything shop, and free shipping pretty much took all online retailers on the entirely new level. Not to mention the gains resulting from m-commerce. Accident or not, Russian Lamoda is right up there with the best of them. (That image still looks creepy, tho). Going through security at the airports is probably one of the most unpleasant things connected with flying (topped only by discovery that you have a middle seat between a screaming baby and a grumpy elder). That's probably because the process of going through security check was never really considered from the point of view of those who have to go through it - humans. The situation was designed from the security point of view: how to minimize chances that someone is going to smuggle something on the plane that can cause considerable damage to others? This is a valid POV, but so is the human-centered one. They are also not exclusive. That is to say, if the situation has been designed with the focus on human experience, rather than just on design of service, we would be able to achieve both. A recent Fast Company article detailed a quite nice idea by two SVA students on how to make the airport security experience more pleasant to those who have to grow though it. I enjoyed the article, but I couldn't help thinking that improving the experience can't involve only creating a more human messaging and gestures aimed to shift passangers' perceptions. This is a short-term, superficial gain aimed at changing the image of TSA rather than the experience it provides. It doesn't solve the problem that security process truly lacks is empathy and the holistic view of the situation (otherwise known as design thinking). As of today, only humans can provide this empathy and a holistic, experience-focused understanding. To change security experience, it is the behavior of security employees that needs to change. A mindset of protection, respect and caring would be nice, for starters. Flexibility and empathy would help a lot, too. Considering the entire experience through passangers eyes would seal the deal. Security employees are in the experience business. For them be successful, the premise needs to become their delivering a superior customer experience. This scenario doesn't seem terribly realistic right this moment, but at least it's a possibility. Moda Operandi is something of a digital fashion forerunner. First, it allowed its customers to shop runaway items only days after the show. Now, it takes the runway-sales cycle up a notch, with its new mobile app that allows fashion-obsessed to “yay” or “nay” the runaway looks in real time. Once the “yay” looks become available for sale couple of days later, you are of course the first to know. This is a great example of putting together content, commerce and game mechanics in one. Oh god. This is probably the last thing that already overstimulated Brooklyn moms need right now: an ability to message the farmers that harvested the ingredients of their carefully selected, uber-local, beyond organic meals. Yet, that's what they have, thanks to Cisse Trading Co. The company prints QR codes on its chocolate deserts and cocoa drinks that allow customers to post a note to farmers whose labor created the ingredients. Once users scan the QR code, they are taken to the company's Facebook page where they can leave a note for the wonderful farmers that provided for us. While this is, personally, a bit of an overkill for me, I can totally see giants like Kraft jumping on this trend. After all, brands are all about sustainability and transparency these days, might as well work really good for them. Food companies should add this to their branding playbook. In other words, forget about Mr. C. Citizen M is everything you need in terms of luxury lodging. Aside of incredibly straightforward home page (no silly photos of happy couples lounging at the beach at sunset), Citizen M offers accessible luxury that's literally downsized. How does this happen? Based on the insight that frequent travelers, like professionals, globetrotters, weekenders, fashion-obsessed and "affair-havers" (in CitizenM's own words, not mine!) seek luxury experience but not necessarily luxurious space, this expanding hotel chain created tiny rooms that can live up to any exclusive boutique hotel standard. The rooms are really, really tiny, though. I know that NewYorkers won't mind, but I am not sure about the rest. Once digital brands scale enough, their cease to be disruptors and become a full-blown competitors to incumbents in the market they are operating. Their strategy revolves around the definition of who they are competing with. Having clarity about the key competitor protects digital entrants against a) being copied by this competitor and b) being acquired by it. “The network that we think is likely to be our biggest long-term competitor-for-content is HBO. In the USA for example, HBO recently won long-term exclusive domestic movie output deals with Universal and Fox. HBO bids against us on many original content projects though is not currently a bidder against us for prior-season television from other networks”. Netflix is already on it, but AirBnB, Warby Parker, Uber, Spotify and others should take note: Who are you competing against? Who is your absolutely key competitor? I can see how food brands can jump on Instagram video recipes. In 16s or less, they can demo their products, show how to mix ingredients together and lead you through the steps towards a tasty meal. This is not yet a trend, through. For now, only an enthusiastic Dutch cook has taken to the platform to host his "Bart Fish Tales" Instagram video series. So far, the series is only moderately popular, but it being an incredibly easy way for brands to do something useful both for their audience and for their brand awareness, we've probably see more of this content format pretty soon. Path to a home-cooked meal has never been shorter. Literally. Cooked up (um) by three Londoners,Eatro is a crowdsourced service that allows ordering homemade meals from one's neighbors. Willing and able home chefs can list their services on Eatro, and their hungry co-habitants can browse types of food, discover what's on offering nearby and buy a meal. Eatro basically zoomed-in on an unmet demand of busy people living in big cities: their desire for a good, home-cooked food. Then it built a business around it (Eatro charges chefs 12%). On the heels of Soda Stream popularity, Coca-Cola decided that it's time to let go of its magic formula (well, not really) and allow people to make Coke at home. Or something very similar to it. There's of course concern that people making sodas at home will undermine sales of Colas outside of the above mentioned homes, but so far this haven't happened in the coffee industry. People are buying their coffees-on-the-go like crazy. Just look at Starbucks. Minibar is the new on-demand alcohol service, described creatively as “the easiest way to lift your spirits.” There may be some truth to it. After signing up, users are prompted to enter their zipcode and their favorite drink, and to sit back and relax. In just under an hour, they can expect their delivery. This app is perfect for parties that run out of booze, whimsical drinking, or sudden and unexpected cravings. The question remains, can we have too much of a good thing a.k.a. is a frictionless experience really that good for us? This is such a wonderfully human idea, cooked up by two advertising people, and enabled by their agency, M&C Saatchi in Cape Town. It's a pop-up store in the affluent neighborhood of Cape Town, called Greenpoint, and it's a pop-up store for the homeless. The human psychology insight here is that people are willing to donate more clothes and more often, if they don't have to go through the hoops of dropping the bags off, scheduling the pickup times, and the like. Best is just to let them drop it in front of their own door. Which is roughly what the "Street Store" does. Clothes are neatly displayed, making them easy to browse through, so homeless persons can pick and choose the items they like. All the print materials, that both housed the clothes and announced the shop, were made re-printable, so anyone who wants to replicate the idea under the same brand can do it. Great idea. CVS, the second largest pharmacy in the USA, is going to stop selling cigarettes on October 1, 2014. CVS CEO said that selling cigarettes is inconsistent with "CVS purpose." This is no doubt a giant step in a healthier direction and a giant brand affinity push, but cynics among us can't help but draw the conclusion that selling soda and sugar-infested, hyper-processed food got to be consistent with CVS purpose, because, as of yet, there's no word on whether they will be pulled from shelves, too. Julian Cole did it again. He put together his annual top industry talent list, and it's global, diverse and impressive. (Personally, I am happy it's alphabetical, otherwise I'd be a teeny tiny tumbnail). Great job, Jules! I love everything about this idea. Cooked up by Ai Wei Wei, the notorious Chinese artist and Olafur Eliasson, the purveyor of unusual things, it's a global, interactive and fun thing that you should definitely play with here. 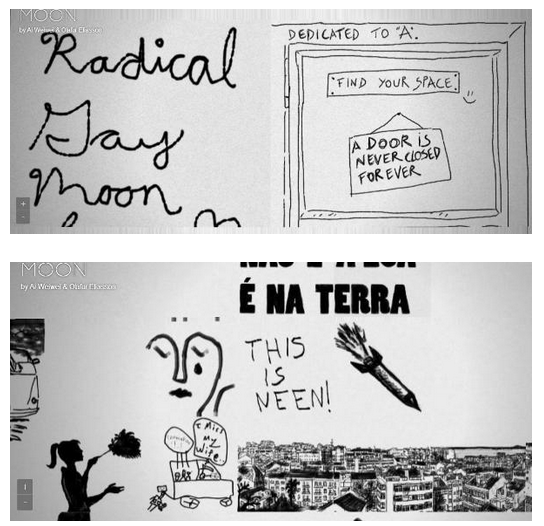 Described as "an interactive online global art project," the site lets you draw on the moon. Yup. First, there was The Spring, which I wrote about here couple of months ago, and which recently shut down. Now, there is Mogl, and I really hope this one stays around a little bit longer since both startups share the same amazing idea of connecting dining out and doing good. Responding to the sad statistics that 15 million Americans are food insecure, Mogl app lets consumers donate money directly to food banks every time they dine out in one of the restaurants participating in this program. Consumers can choose the amount of money they want to donate. The incentive is monetary and straightforward: 10% cash back of your bill. This is great for group dining, where individuals will, no doubt, want to outdonate each other, and where 10% of the group bill is not negigable. There aren't any restaurants taking part in this program in NYC, but I am very eager to try it out. What's your industry's black market? The case of maternity wear. There are few product categories that are more neglected than pregnancy wear. As a consequence of pregnancy wear's limited life, women are reluctant to invest a lot of money in it. Consequently, the retail offerings go either very pricey niche or very unappealing mass. In other words, retailers opt in to either go luxury, attracting a limited number of customers, or the absolute mass, reducing the prices at the expense of quality. At the same time, the black market for the pregancy wear is vast. Black market here refers not to illegal activities, but to new social models of economic exchange that evolved with digital technology. Women share, swap, or give away their pregnancy clothes either to be helpful or just to get rid of them. And where is black market - a.k.a. new socio-economic activity - there's a potential for innovation. An industry's black market is the true indicator of how rife the industry is for disruption. And so it goes: two examples that come to mind are Borrow Your Bump and Rent Maternity Wear. Both are online marketplaces where women can browse, buy or borrow items from each other. Because the product selection is carefully curated, the quality and diversity of products is higher than what the industry offers. Due to the rental option, they are also more affordable. Borrow Your Bump goes a step ahead and sends personalized product selection to first-time users; from the convenience of their home, they can try and keep items they love and return the rest, and no cost. The takeaway? Best and the most disruptive business models build upon on social and economic activity that customers are already doing, and help them do it in a better, faster and more efficient way. We should be exploring black markets more. Cheerios partnered with the Family Dinner Project to create something pretty amazing called Family Breakfast Project. The project encourages families to start they day together, through a simple series of 7 topics/ideas for 7 days (e.g. Day 1 theme is "Laugh," Day 2 theme is "Connect," and so on) that will give families something to do and talk about while enjoying their breakfast. Conversation starters, advice and different themes should provide families with a fun morning routine. The Cheerios site, where families can find all of these, also displays Cheerios commercials, user-generated content, and incentive to pass the initiative on. This is an amazing example of brand utility, social responsibility, and savvy marketing, all mixed in one. Done by always great Zeus Jones. Rotting food, in supermarket shelves and in our own refrigerators, is a big problem. So big in fact, that its weight is 7 million tons. To solve it or, at least minimize it, scientists created a microchip that when inserted into food packaging communicates the freshness of the food inside. As the shelf-life and expiration date nears, the package starts texting the owner, alerting them to consume the food before it goes bad. Now, the question is, would we care? After all, if all we ever eat is nearly-deceased vegetables, then our diet becomes a race against rot. Do we want to shape our lifestyle around the dying carrots? "No, I can't go out tonight, my stack of beets is going to expire. I simply must eat them now." More environmentally & socially conscious among us will welcome this innovation, though. The rumor is that, Holland, always the innovator, is going to implement this technology pretty soon. Stay tuned. Chinese Twitter, Sina Weibo, did something very smart: it integrated Alibaba's e-commerce capabilities into its service. Imagine Twitter where you could buy anything you wanted with a click, and you get the idea. "Weibo Payment" is that click, and it connects users Alibaba accounts (called Alipay) with their Weibo accounts. It's as if Twitter and PayPay banded up and allowed us to buy whatever we want in our Twitter streat. Why on earth Twitter hasn't already done this, beats me. Here's what one does if they really, really dislike Starbucks. Two baristas created DC Disloyalty Card. The benefits, according to the founders, are too many to count. First, by acquiring a disloyalty card, consumers firmly put themselves in the "let's support the local coffee shops" team. Then, they express their anti-corporate sentiment. Then, they probably also feel good about themselves because of the above two. And finally, they enjoy some damn good local coffee. So how does the disloyalty card work? Apparently, one needs to buy a coffee from the six participating local shops, and their seventh cup will be free. Get it? By being disloyal to one single coffee shop, consumers get rewarded to a free drink. They also get to know their local coffee joints, taste different kinds of coffee, and try something new. Disloyalty = diversity. How would you look if you weren't photoshopped? Aerie finds out. This is something more of lingerie brands should do if they had the balls (um...). Featuring real-life, non-skinny women so far has helped only Dove to become an iconic brand with its "Real Beauty" campaign, but lingerie industry seems slow to respond. Well, until now. Aerie (an American Eagle company) launched "Aerie Real" campaign showing non-Photoshopped models. They look amazing. The effort is even more meaningful knowing Aerie's audience: adolescent girls between 15 - 21 who are still figuring out their body image. There's also #aeriereal social component to the campaign, where girls submit their own photos. I'd really love to see sales this campaign generated. Hope it was more than the usual one would, giving this brand a financial incentive to keep doing great stuff like this. Very rarely any of us likes to see an ad on our mobile phone. But what if the mood is right? That's exactly what Apple is experimenting with. The next-gen ad serving will look at things like time of the day, location, current activity, mood, heart rate, blood pressure, adrenaline level, body temperature and other parameters and determine our emotional state. For this, of course, we need a wearable tech device, but Apple's already working on that too. Advertisers should be thrilled, but then again, knowing Apple, it's probably going to be a pricey, closed system. Fashion Touchdown: A misstep in branding or a great idea? For anyone who lives in the U.S.and works in advertising, there is no bigger annual event than Super Bowl (Personally, I have little idea what's going on in American football and advertising bores me). But, it's the time when brands go crazy, on the TV-screen and off-. And when I say that brands go crazy, I mean all brands. Even those that - for all intents and purposes - have nothing to do with either football, men or beer. But, brands are all about in-the-moment relevance, it comes as no surprise that Bloomingdale's wanted to jump the Super Bowl wagon. The retailer created a fashion/football auction where the lucky bidder can win one of the helmets exclusively designed by one of the 48 designers ranging from unknown rookies to Cynthia Rowley. All proceeds are going to NFL Foundation. Is the idea of fashion touchdown a branding faux-pass or a great opportunity? I'd need to see how many people actually bid on, in all truth, very neatly designed helmets to know the answer. A bit obvious for anyone working in digital space, but I enjoyed reading this article nevertheless. There are article pins, product pins, place pins, recipe pins and movie pins. And all of them contain information that is just what you are looking for. Retailers, hotels, publishers, CPG brands are somewhere rubbing their hands in delight. This is contextual advertising at its best, mixed with a heavy dollop of utility. The sexiest of them all are product pins, clearly, as they are the perfect outlet for relevant product information: price, availability, shopping and, of course, the opportunity to shop. And all of this without ever leaving the Pinterest universe. Make no mistake: retailers benefit plenty - once user decided to buy a product, the rest of the transaction is completed on the retailer website. The bottom of the funnel is the same - it's its top that has gotten more complex, and for the better. Warby Parker for mattresses? Sure, why not. In the domain of online shopping, there are some things that are thought to be off-limits. Like sunglasses. Like shoes. Like mattresses. Apparently, this perception all wrong, as Warby Parker, TOMS and now Tuft and Needle have demonstrated. The latter is the foam-mattress business that sells its much-loved products exclusively online, through their website and via Amazon, bypassing distributors and all the hustles that go with them. What's the next industry to be disrupted? Hair-coloring, perhaps?